Check here for info on how to get a job in international education and other great info and stories on studying, working, or volunteering abroad. I love that through this blog I have met so many great people around the world. It has only enhanced my ability to be global from home by extending my international network. For all my lovely expat readers and friends that I have met through the blogosphere, I have an opportunity that wanted to share. I am looking to hire expats as On-site Program Coordinators for our short-term faculty-led programs through CISabroad. If you are someone who is currently living outside of the U.S. and would be interested in guiding a group of college students and their professor around your host country, this is the perfect gig. The primary role of this position is to facilitate the in-country implementation of the assigned program and provide safety/emergency support as needed. During the program, the On-Site Program Coordinator is responsible for managing the day-to-day logistics of the assigned customized program and providing in-country support to both the leading faculty and CISabroad students. These positions are contracted and last anywhere from 10 days to 4 weeks. We cover all travel expenses, food, housing, and provide a small stipend. If you or someone you know might be interested in working with me at CISabroad this spring/summer, I would love to answer questions. You can check out the position and find directions to apply on the CISabroad Career page. This entry was posted in International Neighbors, Study Abroad and Beyond and tagged CISabroad, Expat, International, Study Abroad, Travel on December 3, 2012 by eliseblalock. This past week was International Education Week in the US. Colleges and universities around the country celebrated the week by hosting various events of an international nature. 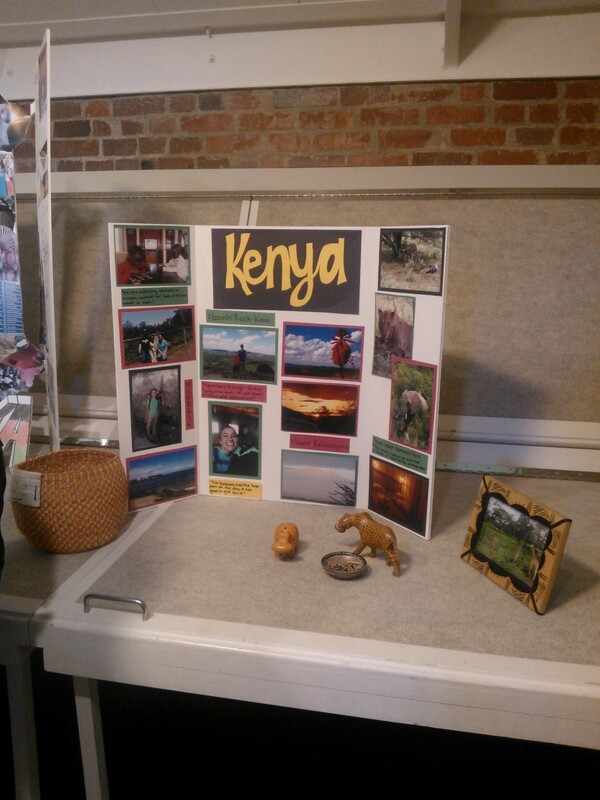 I was able to make a trip to Stillwater, OK and visit the campus of Oklahoma State University on Friday and attend a few of their International Ed Week activities, including a gallery display by a group of students who had studied abroad this past summer in Kenya. As I walked down the hall viewing the poster displays, I saw a few students gathered together. I asked them if they had gone on the program and immediately they perked up. “Tell me about it,” I said. From there I heard all about their itinerary, the local students they were paired with, the orphanage they visited, and the baskets they bought from the local women who were trying to develop a self-sustaining community. These young women were so enthusiastic about their experience. Just by standing with them for ten minutes, it was obvious how much studying abroad in Kenya had impacted them and opened their eyes to the world around them. I identified with their emotions and it reminded of how studying abroad changed me. For those of us who have traveled, I think we all yearn for someone to say to us, “Tell me about it.” So often I hear from students that they return from abroad only to realize that their friends and family are not all that interested in hearing about their experience. But for those of us on a mission to be global from home, living vicariously through others who have traveled recently is so important. Not only do we provide an outlet and a listening ear for the traveler, but the traveler also helps us stay engaged with the international community through their stories. So dear readers, the next time a friend or family member returns from abroad be sure to ask them about their experience, and if you ever need someone else be on the listening side of your travels, let me know. I happy to hear all about it. 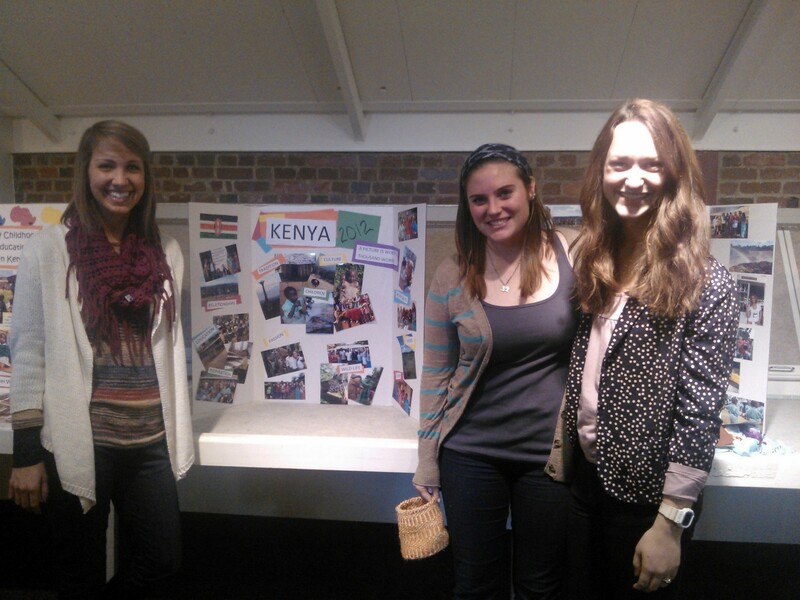 This entry was posted in International Neighbors, Study Abroad and Beyond and tagged Culture, International, Kenya, Study Abroad, Travel on November 19, 2012 by eliseblalock. One thing I always tell students is they have to have disasters when they study abroad. Otherwise, they wouldn’t have any good stories to tell when they come home. People are always so scared they’ll get lost, get sick, get hit-on, or get pick pocketed that they don’t fully enjoy themselves. And while none of those things are fun when they happen nor am I advocating being lackadaisical, they really are the stories we tell when we get back. I recently met with a student at my university who studied in India last semester. She had presented on her study abroad experience just a few weeks ago and had shown some of her photographs from her semester abroad during her presentation. 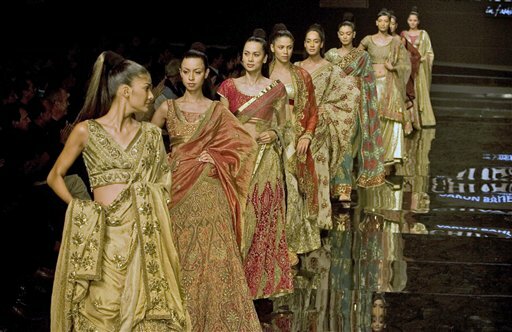 One of the pictures that caught my attention was of her walking down a catwalk in a long gown. When I asked her about the photo she explained that it was actually an awkward experience. Some of the Indian students she had met were fashion majors and asked her and several other American students to be in their fashion show. She talked about meeting up for practice and learning about “Indian time”. Sometimes practice would start an hour later. Other times she would come late and they would already be done. She said the gown itself was also an issue. As a rather tall girl, especially by Indian standards, she was slightly stunned that her gown was far too long for her. At 5’9″ she towered over her Indian friends. So who was this dress made for? We laughed over her stories, the reactions from both her and her Indian peers, and the absurdity of some of the situations. Then I shared my theory. No disasters = no good stories. She thought for a moment and realized that it was true. Almost all the stories she shared from India were disasters at the time. What disasters from your travels do you share? I’d love some good stories! This entry was posted in Study Abroad and Beyond and tagged Culture, India, Study Abroad, Travel on November 2, 2012 by eliseblalock. Well, dear readers, I’m happy to say that I am once again employed in the field I love. In fact, I’m over-employed and working part-time for both a study abroad company and as a study abroad advisor at a small Christian college here in OKC. While the freedom of unemployment was somewhat enjoyable, I am thrilled to give it up in return for working with students again and helping them experience the world beyond. I’m also looking forward to blogging again about all the cultural events of a college campus. Hopefully the lunch series will be back up and running soon! 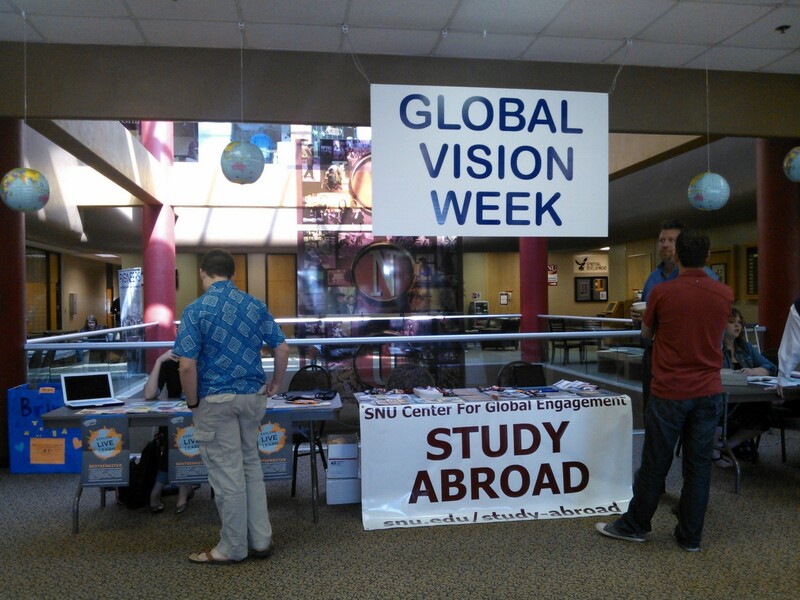 This week is Global Vision Week at the college I am working at and with that came the study abroad fair and international cuisine in the cafeteria. I spent the day meeting students and talking about their dream destinations. Unfortunately the international cuisine was nowhere near as good as the conversation. 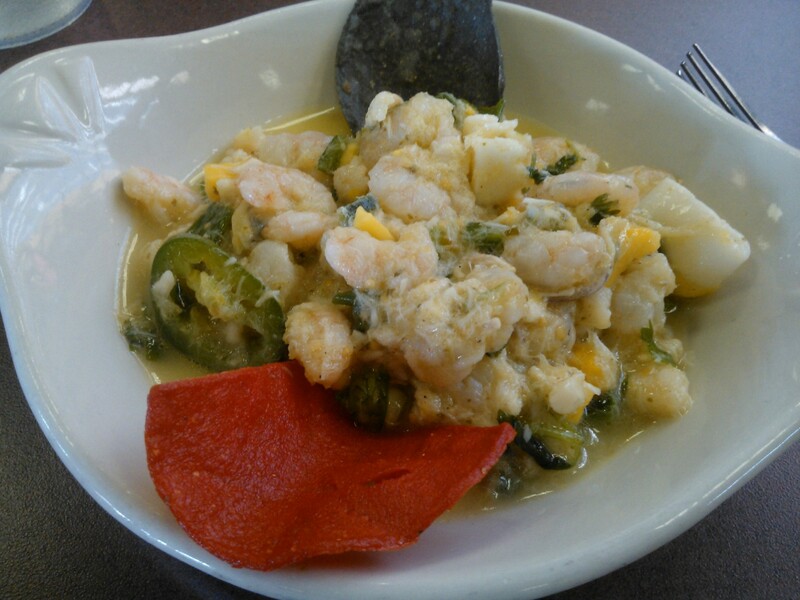 I would not recommend the college cafeteria as the appropriate place to try ceviche. I’m just hoping it didn’t scare anybody off the idea of studying in Peru! Let’s just say that this ceviche needed a lot more chips to be enjoyable. This entry was posted in Ethnic and Tasty, Study Abroad and Beyond and tagged Ceviche, College, Culture, Job, Study Abroad on October 16, 2012 by eliseblalock. When I was last home I spent some time in my parents’ basement. Its large and unfinished and my brother, cousins and I have consistently used it as a storage unit. The fun part is that it’s like going through a time capsule every time I go down there. As a kid, whenever my closet got full, I would just gather up all my pictures, mementos, yearbooks, etc., put them in a bin and take them down to the basement. I’ll admit that I was kind of a pack rat back then. But years later, as I begin to go through all the things I kept, I have to say I’m glad that I had some hoarder tendencies. In those boxes, I found some great memorabilia from my childhood through my years of studying abroad. Here are just a few things that stuck out from my time capsule. 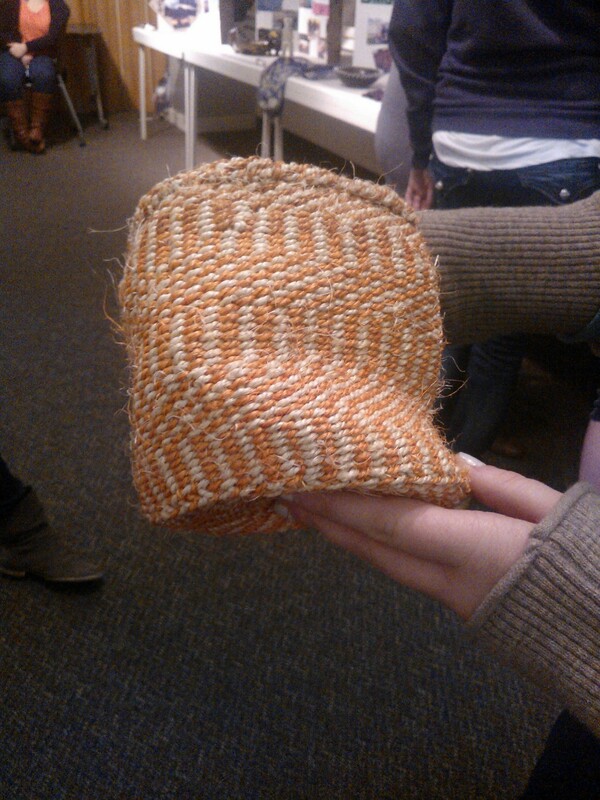 My friends and I have decided that there are two things that women who travel wear: scarves and hats. As you can see at the age of 5, I was already embracing my future as a traveler. 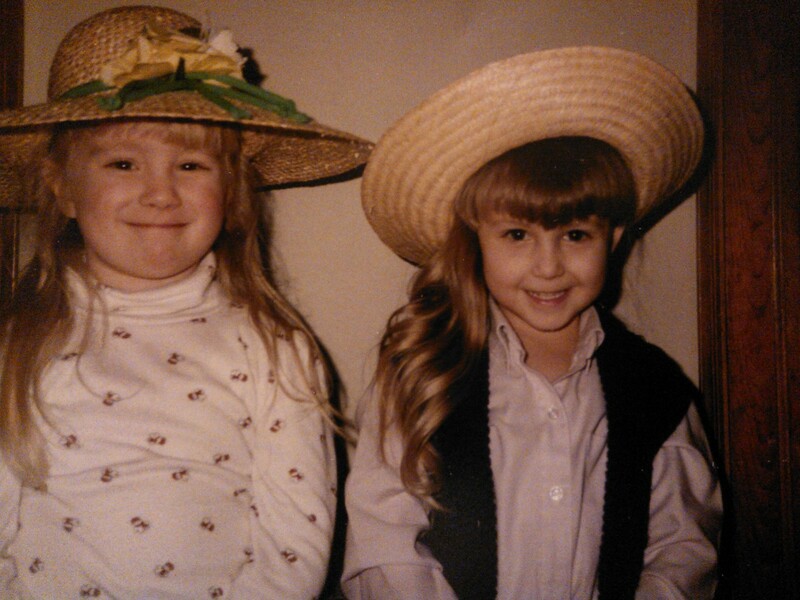 Or I was trying to be Anne of Green Gables. One or the other. I’m the shorty on the right. When I was a junior in high school, my family made a trip across the Atlantic for the first time to visit my big brother who was stationed in Germany. Upon getting off the airplane, this was my first picture. The airport bathrooms in Germany had the self-cleaning toilets and I was beyond amazed with German ingenuity. Now having traveled with lots of students on their first experience abroad, I’ve discovered that foreign bathrooms are a common interest. 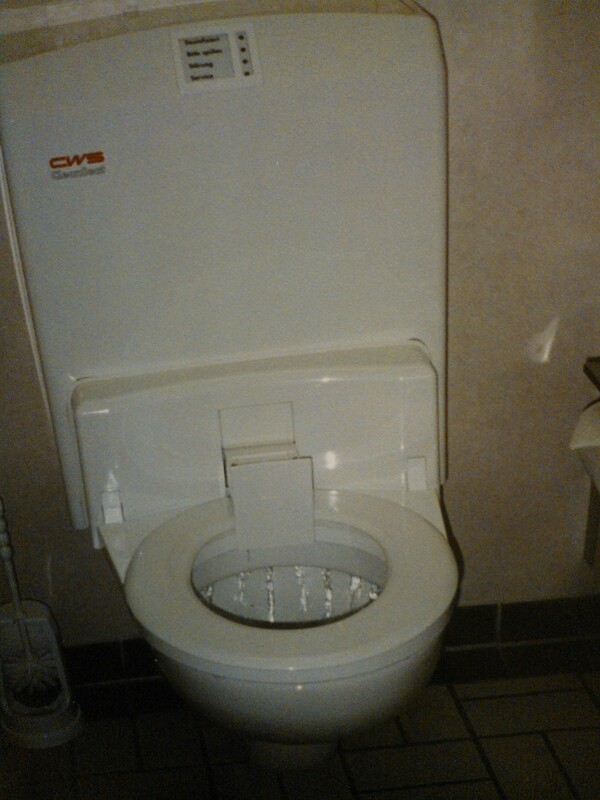 And I’m not going to lie, I know for a fact this isn’t the only toilet I’ve taken a picture of in my past 14 years. Also buried in the basement were all my old study abroad journals. This one was from my second summer in Italy. 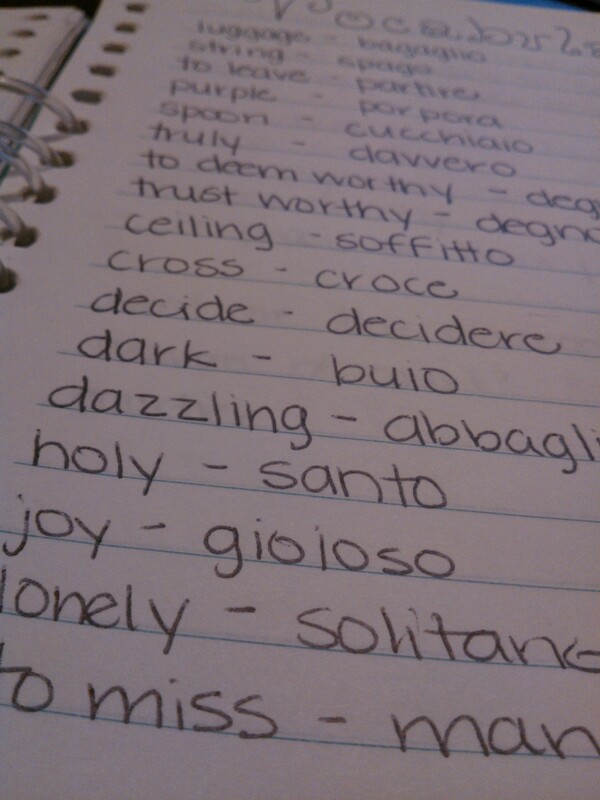 It was written in (poor) Italian and was full of my vocabulary, sketches, and the daily challenges and triumphs. As I read through the words that I decided to look up, the questions I wrote down, and the experiences that I struggled with as a 21-year-old college student, I see how much I grew up through my time abroad. But of all the pictures and notes, this one is beyond far my favorite. 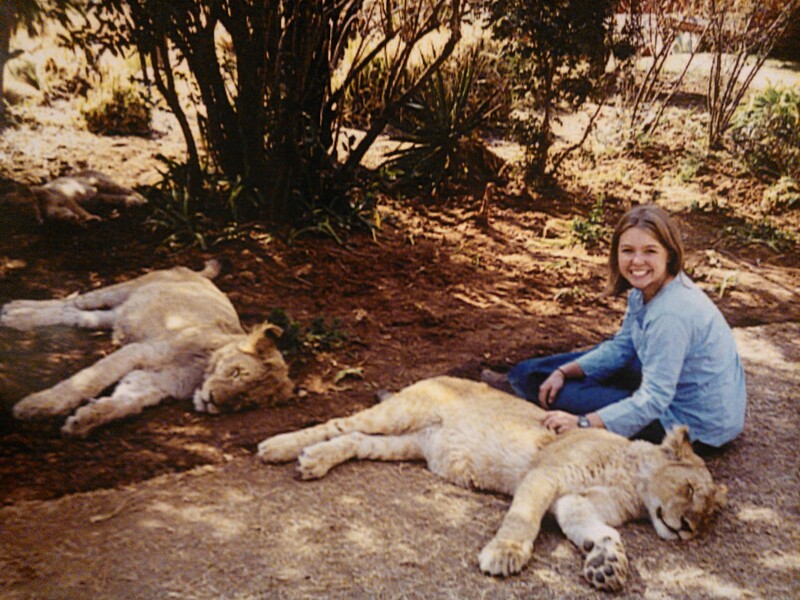 After I graduated from high school, I spent four weeks in the mountains of KwaZulu-Natal attempting to teach economics in the local high school. As I look at this photo, it is a reminder that we all need to leave our comfort zones for a while, take risks, and that often what we are most afraid of is actually quite harmless. Have you kept journals and pictures from travels gone by? Read and look through them and share your old memories that have come back! 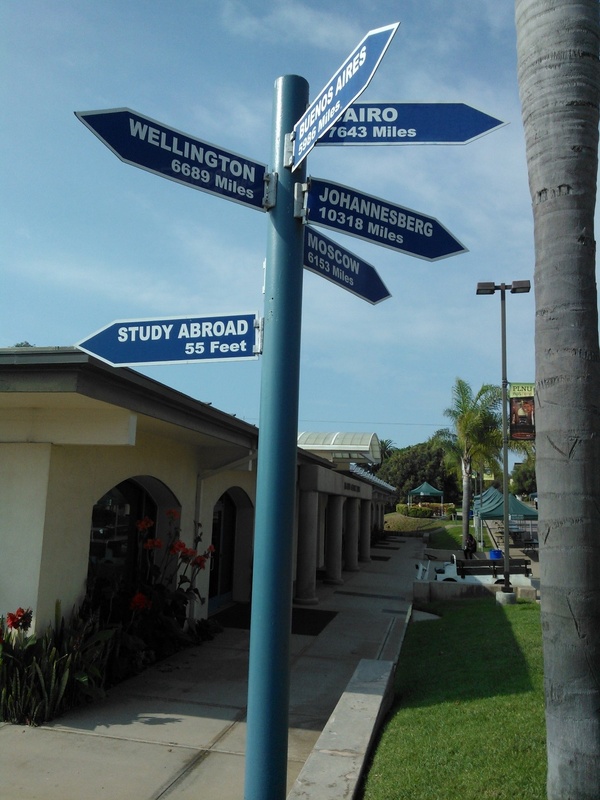 This entry was posted in Study Abroad and Beyond and tagged Memories, Study Abroad, Thoughts, Time Capsule, Travel on October 11, 2012 by eliseblalock. I’ve talked about the hostility stage before but it is one of those things that I have to remind myself about often. Moving is hard. Language barriers are hard. Making new friends is hard. But it’s all worth it and it does get easier. I wanted to perfect my Italian while I was studying abroad in Italy but I would regularly get side tracked and have days that I would solely speak in English. I found I had to keep coming back to my goals, remembering what I wanted to get out of my time abroad. One of the best things I did while studying abroad was do things alone. I went to the market alone, visited museums alone, and would find beautiful spots throughout Rome where I could sit and read or journal. The time alone made me appreciate being abroad so much more. In those moments it wasn’t about the people I was with, but rather the place where I was living. My first time abroad in 2002 I journaled the entire time. Ten years later, I am so grateful for those journals. Without them I probably wouldn’t remember the day that I missed the bus to Cinque Terre or the time my roommate washed her underwear in our bidet. This entry was posted in Study Abroad and Beyond and tagged Advice, Moving, Study Abroad, Travel on September 10, 2012 by eliseblalock. In study abroad, the stages of cultural adjustment are normal. We try to prepare our students that there will be times when they will not like their host country. They will think Italian transportation strikes are ridiculous or will get frustrated that Japanese restaurants never have forks. Sometimes the hostility stage is more severe and they will want to go home. We try to give them the tools for coping with the stage but realize that we can’t eliminate it from happening. When we moved to Oklahoma, I knew I had to be proactive to feel grounded here. I contacted the PhD program director to talk about applying. I got in touch with an organization that works with the refugee community to volunteer. We have consistently gone to a new church every Sunday trying to find the right one. But despite all of the effort, currently I find myself in the hostility stage. While many things are in the works (home, church, friends, and activities), in this moment I am lonely and lacking things to do. I miss my friends and my job and if we were offered the chance to move back to San Diego, I would probably take it. My big brother called me last night and asked me, “So how is the transition going?” He knew the right question to ask as he has been in my shoes before. I told him about a post by Clearing Customs I read about a week ago about the grieving process. It quoted Ruth Van Reken who said, “Every time there’s transition, there is loss,” and “where there’s loss, there’s grief.” I said that I’m grieving what I left behind in San Diego. He told me that when he was living in Germany, every time someone left to go back home, he grieved as well. He made me feel normal, while reminding me that this is a stage and soon I will feel at home here too. Although I am not very fond of the hostility stage and just wish I could fit in, feel useful, and find purpose in this new city, I know it’s part of the process. I also have to remember that you can’t grieve what you never had. I am thankful that I had so much in San Diego to grieve for and wonderful people like my big brother who understand. 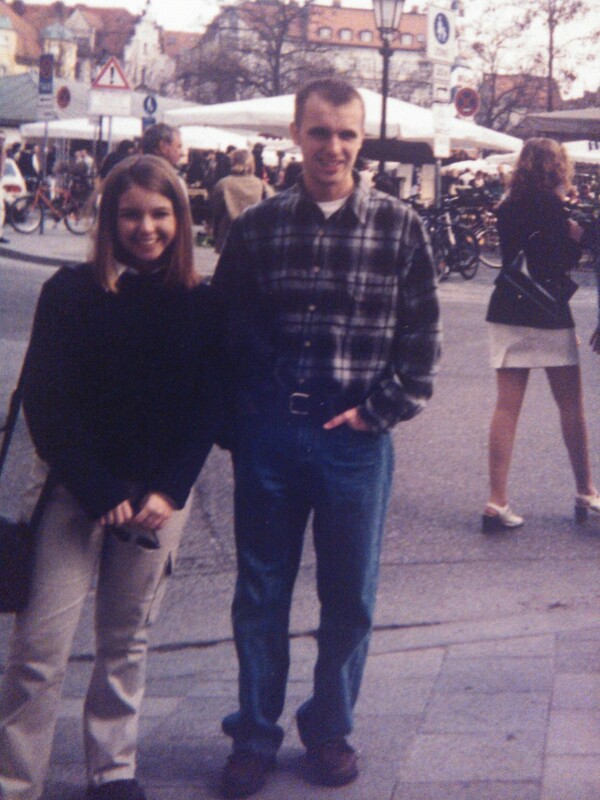 This is me visiting my big brother in Germany in 1999. This entry was posted in Study Abroad and Beyond and tagged Culture, Moving, Study Abroad, Transition on August 24, 2012 by eliseblalock.